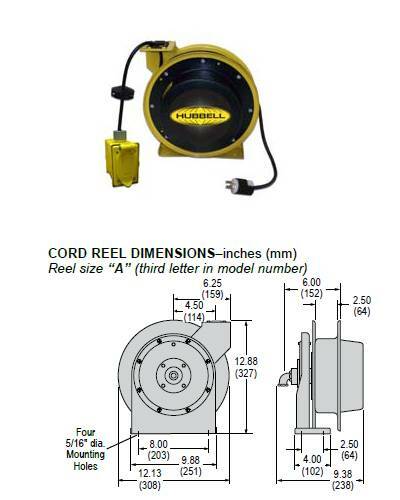 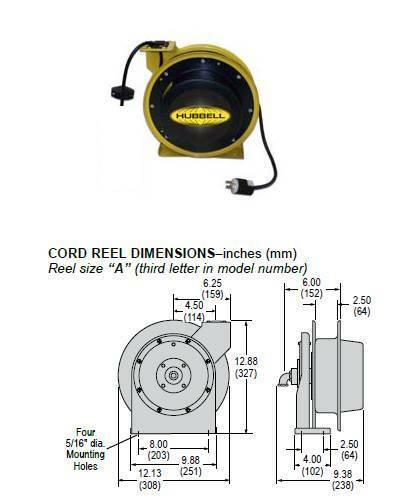 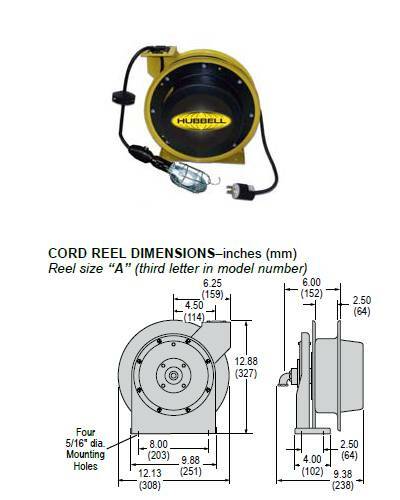 CORD REELS with fluorescent or incandescent lamp, dual outlet box or single outlet. 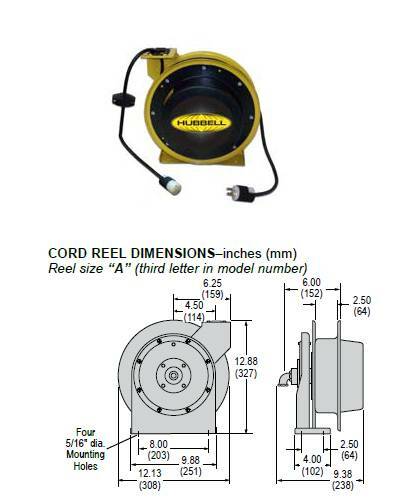 Also available with bare cord so you can install your own lamp or outlet. 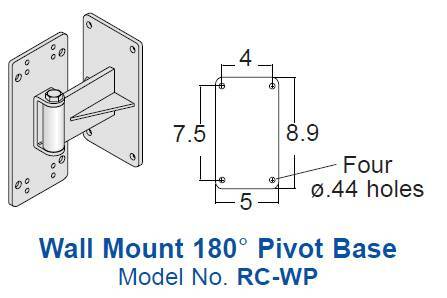 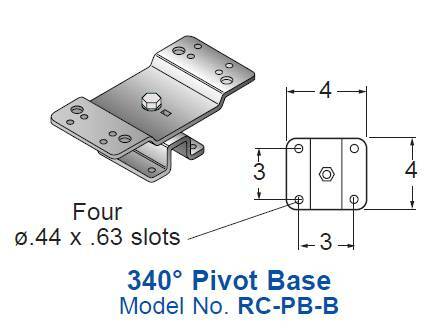 Ideal for a wide variety of industrial applications mounted from wall, ceiling or under workbench. Cord lengths from 25' to 70'. All reels include spring rewind and ratchet lock. Operator simply pulls cord off spool. 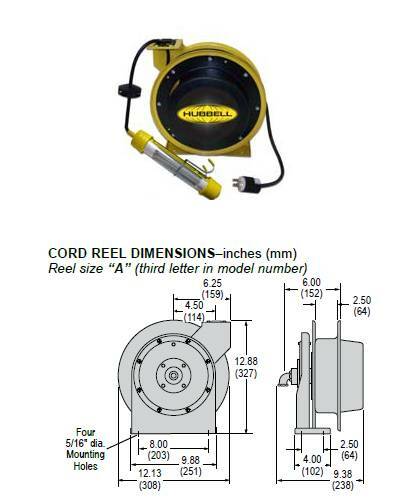 Ratchet lock maintains desired cable length and, when task is completed, a slight pull releases the ratchet allowing the spring motor to rewind the cord. Reels feature heavy steel frame with baked-on polyester finish. 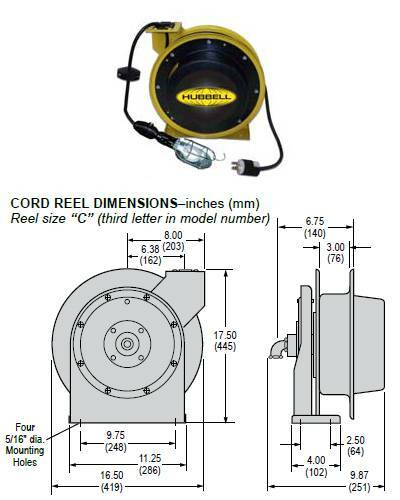 (24LBS) H 10" L 13" W 13"
(25LBS) H 10" L 13" W 13"
(26LBS) H 10" L 13" W 13"
(40LBS) H 17" L 18" W 10"
(41LBS) H 17" L 18" W 10"
(23LBS) H 10" L 13" W 13"
(36LBS) H 17" L 18" W 10"
(27LBS) H 10" L 13" W 13"
(29LBS) H 10" L 13" W 13"
(37LBS) H 17" L 18" W 10"
(43LBS) H 17" L 18" W 10"
(48LBS) H 17" L 18" W 10"
(45LBS) H 17" L 18" W 10"
(50LBS) H 17" L 18" W 10"
(22LBS) H 10" L 13" W 13"
(35LBS) H 17" L 18" W 10"
(2LBS) H 5" L 5" W 5"